Although there were five of us tonight, John was busy on the phone for the first half of the evening so four of us tried the brand new Asmodee game, Mission: Red Planet by Bruno Faidutti and Bruno Cathala. And what an excellent game it is too. The game is about sending astronauts to Mars and exploring the various regions for precious resources. Whoever is the most prolific explorer in each region at the end of rounds 5, 8 and 10 score victory points, more points being available as the game progresses. The mechanics are sort of a Citadels meets El Grande combination, which works extremely well. Each player chooses which of their 9 characters to utilise on a turn and once used, the character cannot be repeated until you pick the weakest character, the Recruiter, to bring all your characters back into your hand. Once everyone has chosen, each character gets actioned in a set order (as in Citadels) and this is where the fun really sets in, trying to work out what others are playing as earlier characters can impact on whether a later character can carry out its action or limit its effectiveness. The actions determine how many astronauts you are able to load onto a rocket that turn and give another effect to help you or hinder others. Once everyone has taken an action, full rockets are moved to a set region of Mars and the Astronauts deposited there. At the end of rounds 5, 8 and 10, whoever has the most astronauts in each region gets to collect the resources (victory points available there). After the tenth round, certain bonus points are awarded for fulfilling secret missions or making certain discoveries in the outer regions of Mars and then, whoever has amassed the most points wins. This is a really interesting game with players faced with lots of gut-wrenching decisions, trying to take into account what others are doing. It really did have us engrossed throughout the game. Turn order matters more than at first seems apparent and timing when to use the Recruiter is an important aspect. Being our first play, none of us quite appreciated how things would develop and Iâ€™m sure a second game would see us all building on what we learnt from the first game. After the second scoring, it was interesting to note that three players were tied on 15 points with the fourth on just 6 but having an almost insurpassable lead for the 9 bonus points for most ice crystals. As it was, the Utopia region was critical in the final stage and Mark K engineered a majority, which was supplemented by a very useful Discovery tile to add to his points. 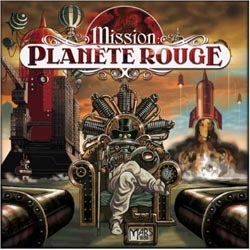 Mission: Red Planet is one of the best games weâ€™ve played in 2006 (Nige was certain it was his favourite by far and promptly ordered a copy). It took us about 90 minutes but the first few turns were slow as we were getting to grips with the various character abilities: 60 minutes is probably not far of the mark once everyone knows how to play. The only thing that irritated me was the box insert was designed to hold the contents in place before all the bits were punched out and had absolutely no use for storing the various pieces once the game had been played. A very silly flaw that I would never have expected to have been overlooked. Still, that one niggle aside, a beautifully engineered design that we will certainly be playing again soon. 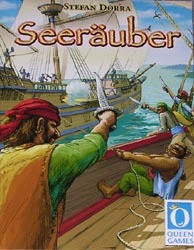 John was then able to join us for a first outing of Seerauber by Stefan Dorra and published by Queen games. 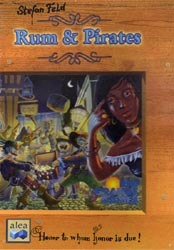 Yet another pirate game, this sees players assembling a crew to attempt to raid various sized ships to plunder their treasure. However, treasure isnâ€™t the main goal in the game, itâ€™s money. This is because when a captain raids a ship, he has to pay wages to each of his crew. Players each have pirates that demand wages of up to 5 ducats. The raided ships have a certain amount of money but, if there isnâ€™t enough to pay all the wages, the captain has to fork out the remainder from his own pocket. There are 5 rounds, during each of which 3 ships are boarded. After the last round, whoever has the most treasure of each type (candlesticks, cutlasses etc,) receives additional ducats but then, whoever has the most money wins. In our game, Mark K got off to a very good start and was able to captain two raids that brought him treasure without paying out too much in wages. In the middle of the game, Nige â€œtrappedâ€ a goodly number of high-wage pirates that he declared he would hold onto and never board a ship (depriving those pirates of any future wages, as they only get paid when a ship is raided). Well, the rest of us thought otherwise and by covering Nigeâ€™s other pirates, forced him to board a ship and pay out about 10 more ducats than he gained. As this was going on, I became captain of a large crew, knowing that a lucrative ship was still to appear and gambling that it would come out on the penultimate round. I failed, as only modest ships appeared and John, who had three pirates on my crew, was able to mutiny and force me to board a ship, costing me a massive 16 ducats. I wasnâ€™t pleased although everyone else found it to be highly amusing. By the end, Mark K was able to capitalise on his early fortune to run out a very easy winner. Seerauber started off appearing a bit bland but, as time went on and the attempts at stuffing other players became more frequent, it got much more interesting. There is a memory element, which isnâ€™t really my cup of tea, but it played pretty well and everyone was occupied throughout. A pity Mark K chalked up a second win but I guess it puts a bit more pressure on Steve in the Hall of Fame. We then moved onto an old favourite. 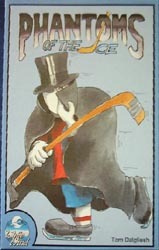 Phantoms of the Ice is a game Iâ€™ve played a lot and it is always terrific fun. Steve and Phil hadnâ€™t played before but itâ€™s so easy to pick up and we were soon constructing our unstoppable teams. Well, some of us were creating unstoppable teams: I seemed to trade bad for worse and John must have been doing the same, as he never challenged anyone to a match the entire game. The nice thing about the game is that the strong teams donâ€™t stay strong for long as everyone wants to trade their dross for your superstars. Phil started with a dismal team and lost three quick matches but then managed to get a decent team and grab 3 wins later on. Mark K and Nige ended up in the final with Nigeâ€™s team looking the stronger on paper. Luck was with Mark though as he scraped a draw in regulation time and took the title in the sudden-death play-off. Put the date in your diary: 2nd and 3rd June when aÂ new ambitious games convention in Birmingham is set to take place. 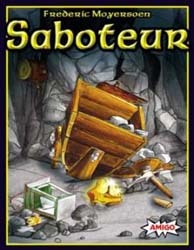 Here is the latest information posted on BGG. The goal is to raise the profile of gaming as a hobby that will appeal not just to a minority of gamers but to families and the general public. â€¢ Uk Games Expo 2007 will be open to the public and well advertised. The venue is a high quality Conference Centre on the corner of Stirling Road and Hagley Road in Birmingham. It offers over 2000sq m of space in a prestigious location. There is a large car park and the venue has many hotels nearby. It is also close to the restaurants and clubs of Broad Street for those who want evening entertainment. And it is next door to Tolkien’s TWO TOWERS. This section is in development. We are in contact with marcus of JKLM and Mark Stetch of ManorCon to get interest from gamers and also the trade/ games producers. The organisers are enthusiastic gamers who will play any game. 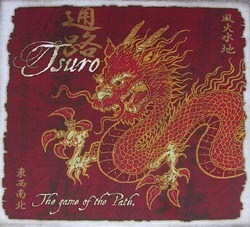 We are members of West Midland Games clubs and have previous experience of running wargames and general gaming shows. This website has no information on it at the moment other than dates and venue. Apparently, there’s “More information soon”. They need at the very least to getÂ the BGG post on the site, even if it’s only a temporary measure. I’ll definitely be trying to get to this and hope it proves successful for the organisers. Well, in spite of there being some doubt as to whether I would get there this year, everythingâ€™s booked. Same hotel: Ypsilon, Best Western; flight out slightly later and back a few hours earlier, which means I get the full day on Thursday but only until lunchtime on the Friday. Not scanned Rickâ€™s Essen preview in any great detail yet but certainly very interested in Leonardo Da Vinci (da Vinci), Hermagor (Mind The Move) and Yspahan (Ystari). Bit annoyed I missed out on Hameln (Fragor) due to the house move meaning I didnâ€™t read about the game until it was sold out on pre-order. Anything else I should be definitely looking out for? Also, is there anyone else who will be there that I should look out for? If you are interested in general information about the fair, you can get details here. I was unable to make it this week but Steve sent me a report. 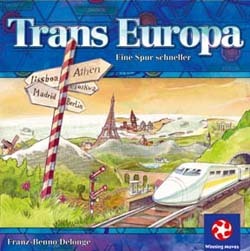 The second game was a 30-minute filler called Trans Europa. This game is a map of Europe covered with a grid of triangles. Each player gets 5 cards; the cards have cities on them, one from each area of Europe. The players then build a railroad network using the triangular grid to get them to their goal of linking the 5 cities shown on their cards, but in doing so also will inadvertently help the other players achieve their goals. Each round someone links their 5 cities and the other players lose points based on how far they were from completing their link. Mark G was the man for this game; his ability to link up his 5 cities whilst the rest of us were floundering was amazing. I was always 2 or 3 turns away from completing my route when Mark announced his success. Iâ€™m not sure were I went wrong as each time we played I felt that I had a reasonable chance of success and each time fell miserably short, although from the moans and groans of the other players I was not alone in my thoughts. We did have a new-comer playing called Adam and as the game was won when one player reaches zero, the game did come to a quicker end then perhaps it would have as Adam found himself quite some distance from his final objective after the second set of routes, so much so that he needed to win the next round to stay in the game. As the more experienced players were not losing at quite such a rate, we might have had more time to recover, but I feel that it still would have ended with Mark G winning, just taking a little longer. I did like the simplicity of the game and I felt that I would have quite liked to start a fresh game straight away. For strategy on winning however, you would have to ask Mark G! I wasn’t able to make it this week but Steve sent this report. 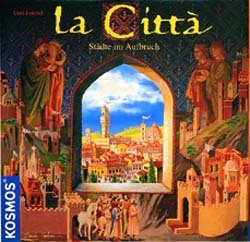 The first game played this evening was La Citta. This is a game that revolves around building cities. We all initially looked for suitable starting places for our first two cities. Mark G positioned both of his cities in the centre of the board; the rest of us went for a mixture of positions. The game then started with all of us expanding our cities to claim the best possible choices of terrain to feed our citizens and with one eye on the type of city tile that was going to be popular with the citizens that year. It is the popularity of the city that is the key to this game, as at the end of a sequence of turns the citizens cast their gaze towards cities within 3 hexes of their own that provide the things they are looking for. Itâ€™s a bit like an election, but the populace quite literally vote with their feet and move to the city they like. My strategy was to create a mega city full of different tile types that would draw in the citizens of all the surrounding players and have my second city as a kind of farm producing food for the ever-growing populace. The feeding of your citizens was for me always a problem. My success with the popularity of my large city was tempered with the fact that I suffered the penalty of lost action cards because I couldnâ€™t feed all of my people. But overall I was willing to put up with this fact, as my large city had become a citizen black hole, expanding in size and swallowing up citizens at an alarming rate from an increasing amount of surrounding cities. As an example of this a new city started by Mark K that initially was at a safe distance from my metropolis soon come under the influence of it and as a result became another feeder city for me. Mark K decided to abandon the city after that and relocated it to a safer part of the board. Both Phil and Mark G lost people, although Mark G held off losing people for some time with a prudent selection of tile types. Ultimately my metropolis was considered by the others to be unbeatable and after 2 and a quarter hours the victory was mine. I think that the length of the game was a little long for some people, but I didnâ€™t find it to bad and didnâ€™t realise how long we had been playing, which is usually the sign of an engaging game. Itâ€™s also not difficult to learn and with a different board layout each time it has a replay-ability factor. There were five of us this week and so we were, at last, able to try the 10th game in the Alea big box series: Rum & Pirates. This has come in for some criticism as it is a bit more family-oriented than others in the series but I think it stands up as a very good game for what itâ€™s seeking to be (albeit that it may be a bit long at 5 rounds for 5 players). Anyway, the five rounds represent five days during which your band of pirate followers are scouring the various town locations for the best plunder before heading to the ship to try and secure a comfy bed for the night. On your turn, you choose between visiting a location, paying a coin to rest, and heading to the ship (which ends your involvement in the round until the beds are allocated). There are 10 different types of location to visit, each of which gives the visitor a different benefit. Most of them allow the active player to gain VP tiles but others allow you to recruit an extra pirate (useful for extending your turn) or claim some rum (which allow 2 re-rolls if you get an unsatisfactory dice result. When you go on the ship, any pirates you have left help you in the wrangling for a decent bed. However, rolling consistently low means you get eliminated pretty quickly, irrespective of how many pirates you take on board (Do I sound bitter? You betcha!) Whoever has the most VPs after five days wins. Rum and Pirates is a lot of fun, providing you take it in the right spirit and donâ€™t mind the die rolls interfering with your best laid plans. I enjoyed it and found that there is a bit of thinking required to map out the best locations to visit, trying to slow your pace to delay going onto the ship and trying not to leave the next player with easy points to be had. I failed remarkably in this respect as Mark G managed to clock up some high-scoring visits that I hadnâ€™t spotted. For example, he managed to get to a four tile pub late in the game with no-one able to join him for some very easy free points. None of us were surprised that he emerged the winner, although his margin of victory wasnâ€™t as high as we thought it was going to be. Good fun and one Iâ€™d lie to try again with either 3 or 4 players. – The comments section of the site has been broken by comment spam (again). Anyway, we should be back up and running now so content will start to appear again. Thanks for your patience. Author Garry LloydPosted on 20th September 2006 Categories SnippetsLeave a comment on Quiet in here, isn’t it? 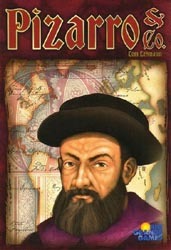 This week, we started off with the excellent auction game, Pizarro & Co. Itâ€™s a while since we last played it and, as a result of us forgetting the relative values of things, Nige got a very cheap James Cook on the first auction. Things soon tightened up, however, and it was difficult to tell who had the best position until things were totted up at the end. If the last couple of auctions had gone differently, Nige would have got the necessary points on his James Cook expedition to win. However, I was shunted out of a Pizarro auction by Mark G with a bid of about 45, so I took the Cook auction but it wasnâ€™t quite enough for me as â€˜dark horseâ€™ Steve had completed his expeditions cheaply and had enough gold cards left in hand to ease past my total. This is a very simple game and there doesn’t appear to be a lot of control one can exercise in a 6-player game. Undoubtedly, there would be more control as a 2- or 3-player game, but 6 players is a fun romp. Now, we agreed at the start that we all had to make sure that Steve lost this game but Nige clearly wasn’t paying attention as the first damage he could cause was to join my and Mark K’s paths together, eliminating the two of us together. Meanwhile, Steve managed to tuck himself away from everyone else and watched while we all conspired to jump off the board in pretty swift order. Another win for Steve. This is a fun end-of-evening game with lots of bluffing. The first round, the good dwarves won quite easily but, in the second, their fortunes were reversed. 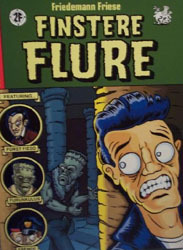 I had all the decent tunnel cards and my fellow goodies were highly incompetent in freeing me from the tirade of broken picks and lamps that were sent my way. In the final round, Mark K found it tough going as the only traitor and the good dwarves emerged triumphant. The bad news, however, was that Steve clocked up a third win of the evening (this time shared with Mark G). The Hall of Fame is looking very depressing for the rest of us.